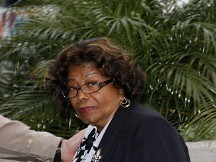 The singer's mother Katherine Jackson announced details of the Cardiff concert during a press conference. She said: "Michael gave his entire life to the world through his love, his music and his devotion to healing the planet." Mrs Jackson added that "as many members of my family that are available" will be at the concert in Wales on October 8. She said: "I am positive that this event will be an event great enough in scale, talent and imagination to form a worthy celebration of Michael's life." No acts have been announced for the concert yet but a notice on the event's website promises "the world's greatest performing artists" will appear. There are plans for the concert to be broadcast around the world to 30 countries in 2D and 3D. It will raise money for three charities including the Los Angeles-based Aids Project. Roger Lewis, group chief executive of the Welsh Rugby Union, which owns and operates the stadium, said: "This extra special concert, paying tribute to one of the world's greatest pop icons of all time and benefiting US and UK charities, is fantastic news for music fans all over the world and it is a huge boost for Wales to host this spectacular one-off show.